Instrument flight rules (IFR) are regulations and procedures for flying aircraft by referring only to the aircraft instrument panel for navigation. 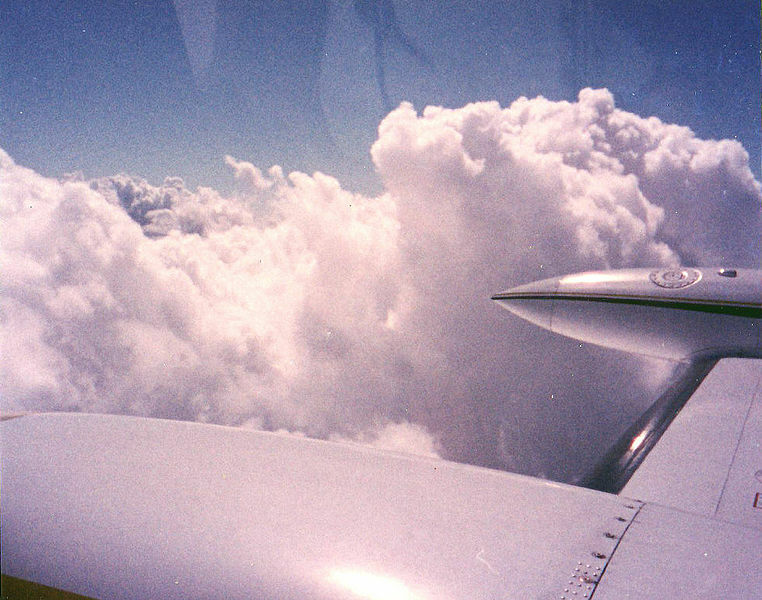 Even if nothing can be seen outside the cockpit windows, an IFR-rated pilot can fly while looking only at the instrument panel. An IFR-rated pilot can also be authorized to fly through clouds, using Air Traffic Control procedures designed to maintain separation from other aircraft. Most scheduled airline flights operate under IFR. Visual Flight Rules (VFR) are often used for sight-seeing flights, aerial photography, or lift services for parachute jumping. Pilots flying under VFR are not permitted to fly through clouds. Many non-commercial, private recreational aircraft also operate under VFR whenever the sky is clear. Under VFR, the pilot is primarily responsible for navigation, obstacle clearance and maintaining separation from other aircraft using the see-and-avoid concept. Several entire books have been written about IFR procedures. The Instrument Flying Handbook, and the Instrument Procedures Handbook, published by the Federal Aviation Administration contain much reliable information about this subject. Both of these books are freely available online (see references below). The distance by which an aircraft avoids obstacles or other aircraft is termed separation. The most important concept of IFR flying is that separation is maintained regardless of weather conditions. In controlled airspace, Air Traffic Control (ATC) separates IFR aircraft from obstacles and other aircraft using a flight clearance based on route, time, distance, speed, and altitude. ATC monitors IFR flights on radar, or through aircraft position reports in areas where radar coverage is not available. Aircraft position reports are sent as voice radio transmissions. Aircraft position reports are not necessary if ATC can see an aircraft on radar. In the United States, a flight operating under IFR is required to provide position reports if ATC advises a pilot that the plane is not visible on radar, using the phrase "radar contact lost". In the US, IFR flights in controlled airspace require an ATC clearance for each part of the flight. A clearance always specifies a clearance limit, which is the farthest the aircraft can fly without a new clearance. In addition, a clearance typically provides a heading or route to follow, altitude, and communication parameters, such as frequencies and transponder codes. In the US, ATC will always issue an IFR clearance the same way. The acronym C-R-A-F-T can be used to remember what order the clearance will come in. The acronym stands for clearance limit (usually an airport), route of travel, altitude of initial level off (sometimes a secondary altitude is given with a time), departure frequency and transponder code. An aircraft operating VFR must also obtain a clearance to enter class B airspace, and is required to maintain an assigned heading or altitude restriction as long as it does not conflict with the safe operation of the aircraft. In uncontrolled airspace, IFR aircraft do not require clearances, and they separate themselves from each other by using charted minimum altitudes to avoid terrain and obstacles, standard cruising altitudes to avoid aircraft flying in different directions, and radio reports over mandatory locations. In the United States and the Southern Domestic Airspace of Canada (SDA), airspace from 18,000 to 60,000 feet (5,586 to 18,288 meters) is designated as class A, requiring an IFR clearance for all aircraft. In other countries class A airspace begins higher or lower. For example, in France class A airspace begins at 19,500 feet (5,850 meters). In the United States even when on a filed IFR flight plan, if conditions permit the pilot is responsible to watch for and avoid other air traffic and obstructions. Separation may also be referred to as 'protection'. The main purpose of IFR is the safe operation of aircraft in Instrument Meteorological Conditions (IMC). The weather is considered to be IMC when it does not meet the minimum requirements for Visual Meteorological Conditions (VMC). To operate safely in IMC, a pilot controls the aircraft relying on flight instruments, and ATC provides separation. It is important not to confuse IFR with IMC. The vast majority of IFR flying is conducted in Visual Meteorological Conditions (VMC). Any time a flight is operating in VMC, the crew is responsible for seeing and avoiding other traffic; however, since the flight is conducted under Instrument Flight Rules, ATC still provides separation services. During flight under IFR, there are no visibility requirements, so flying through clouds is permitted. There are still minimum conditions that must be present in order for the aircraft to take off and land; these will vary according to the kind of operation, the type of navigation aids available, the location and height of terrain and obstructions in the vicinity of the airport, equipment on the aircraft, and the qualifications of the crew. For example, landing at mountain airports such as Reno (KRNO) offer significantly different instrument approaches for aircraft landing on the same runway, but from opposite directions. Aircraft approaching from the north must make visual contact with the airport at a higher altitude than a flight approaching from the south, because of rapidly rising terrain south of the airport. This higher altitude allows a flight crew to clear the obstacle if a landing is not feasible. Although large airliners and, increasingly, smaller aircraft now carry their own terrain awareness and warning system TAWS, these are primarily backup systems providing a last layer of defense if a sequence of errors or omissions causes a dangerous situation. Under IFR, the primary means of navigation are either via radio beacons on the ground, such as VORs and NDBs, or GPS. In areas of radar coverage, ATC may also assign headings to IFR aircraft, also known as radar vectors. Radar vectors are the primary method for ATC to provide separation between aircraft for landing. Modern Flight Management Systems have evolved sufficiently to allow a crew to plan a flight not only as to route and altitude, but to specific time of arrival at specific locations. This capability is used in several trial projects experimenting with four dimensional approach clearances for commercial aircraft, with time as the fourth dimension. These clearances allow ATC to optimize the arrival of aircraft at major airports, which increases airport capacity, and uses less fuel providing monetary and environmental benefits to airlines and the public at large respectively. Specific FAA procedures allow IFR aircraft to transition safely through every stage of flight. These procedures specify how an IFR pilot should respond, even in the event of a complete radio failure, and loss of communications with ATC, including the expected aircraft course and altitude. Here is an example of an IFR clearance, for a Cessna aircraft traveling from Palo Alto airport (KPAO) to Stockton airport (KSCK). "is cleared to Stockton Airport." Clearance Limit: the farthest destination the aircraft is allowed to go under IMC (in most cases it is the destination airport). "After departure, turn right heading zero-six-zero within one mile of the airport." The pilot is expected to execute the right turn to 060° without further ATC prompting within one mile of the departure airport. "Victor-334, SUNOL, Victor-195, Manteca, direct." After arriving at the San Jose VOR, the pilot will likely resume navigation without ATC prompts along the described airways and intersection to the Manteca VOR and then direct to the destination airport. "Climb and maintain 3,000 ..."
After takeoff, climb to an altitude of 3000 feet above sea level. "... expect 5,000 five minutes after departure." Your final altitude assignment is probably going to be 5000 feet above sea level. However, you must follow actual ATC altitude assignments throughout the flight. This portion of the clearance provides a backup if communications are lost, allowing you to proceed to climb and maintain 5000 feet. "Departure frequency is 121.3, ..."
Contact with NORCAL Departure on the specified communication frequency, after Palo Alto Tower tells you to switch. Program your transponder to 4263 so that ATC can positively identify you on radar. Departures are described in an IFR clearance issued by ATC prior to takeoff. The departure clearance may contain an assigned heading, one or more waypoints, and an initial altitude to fly. The clearance can also specify a departure procedure (DP), or standard instrument departure (SID) that should be followed unless "NO DP" is specified in the notes section of the filed flight plan. The approach portion of an IFR flight may begin with a Standard Terminal Arrival Route (STAR), describing common routes to fly to arrive at an initial approach fix (IAF) from which an instrument approach commences. Instrument approaches are categorized as precision and non-precision. Despite the names, a precision approach simply indicates that vertical guidance (as well as lateral guidance) is being used. Non-precision indicates only lateral guidance. In either case, an instrument approach will terminate either in the pilot(s) acquiring sufficient visual reference to carry out a normal landing, or in a missed approach if the required visual reference is not encountered in time. The point at which the crew of an aircraft has to make a decision to either proceed visually, or "miss" the approach is called either the Decision Altitude (DA) or Decision Height (DH) for precision approaches, and missed approach point (MAP) for non-precision approaches. During precision approaches the altitude of the aircraft is determined by the navigational instruments. For non-precision approaches the crew will descend to specific altitudes during the approach procedure, with the final altitude termed the Minimum Descent Altitude (MDA). Some commercial aircraft are equipped with automatic landing systems that allow the aircraft to land without transitioning from instruments to visual conditions for a normal landing. Such autoland operations require specialized equipment, procedures and training, and involve the aircraft, airport, and the crew. Autoland is the only way some major airports such as Paris-Charles de Gaulle Airport remain operational every day of the year. Some modern aircraft are equipped with enhanced vision systems based on infrared sensors, that provide a day-like visual environment and allow operations in conditions and at airports that would otherwise not be suitable for a landing. Commercial aircraft also frequently use such equipment for takeoffs when takeoff minima are not met. Documents describing the approach procedure are frequently called approach plates in reference to the plate-like appearance of single-page sheet that it is printed on. An instrument approach that terminates in a missed approach will continue using missed approach procedure information shown on the approach plate. Typically it describes a transition to a nearby navigational fix, from which the instrument approach can be attempted again. In practice an approach that terminates in a missed approach rarely flies the missed approach procedure as published. Instead, ATC will assign headings and altitudes that will assimilate the aircraft into the arriving traffic for a repeated approach attempt. The crew may also request an alternate destination, either a previously stated alternate airport, or other suitable airport considering the prevailing weather conditions. To fly under IFR, a pilot must have an instrument rating, and must meet currency of experience requirements. In the United States, these currency of experience requirements include six instrument approaches, NAVAID intercepting and tracking, and holding procedures in the past six calendar months. The aircraft must also be equipped and type-certified for instrument flight, and the related navigational equipment must have been inspected within a specific period of time prior to the instrument flight. The UK differs in its pilot-licensing practice from the U.S. In the UK any pilot can decide to which flight rules he adheres provided that the meteorological conditions for those rules are met. The pilot does need an instrument rating to fly in instrument meteorological conditions and under IFR in controlled airspace. The upshot of this is that non-instrument-qualified pilots can elect to fly under IFR in visual meteorological conditions outside controlled airspace. Compared to the rest of the world, the UK's flight crew licensing regime is somewhat unusual in its licensing for meteorological conditions and airspace, rather than flight rules. As a partial alternative to the instrument rating, the UK issues an "IMC rating", the privileges of which include flight under IFR in controlled (classes D and E) airspace and flight outside controlled airspace in instrument meteorological conditions.